From a music festival on the beach to the hunting for candy canes, there is a lot of fun to have this weekend in South Florida. The parade will stage and begin at the north end of the Lake Worth Lagoon and proceed north on the Intracoastal Waterway to the Jupiter Inlet Lighthouse. Tens of thousands of spectators will come out to enjoy the procession of dozens of decorated vessels sparkling on the Intracoastal Waterway beneath a backdrop of traveling fireworks. There will be extended fireworks at Harbourside Place, plus a grand finale at the Jupiter Inlet Lighthouse. Other popular viewing locations include Juno Park, Bert Winters Park, Sawfish Bay Park, and Lighthouse Park. On the water Toy Drive benefiting Toys for Tots with Grand Marshals Mo and Sally from Kool 105.5 . Santa will make an appearance on the last boat of the parade. 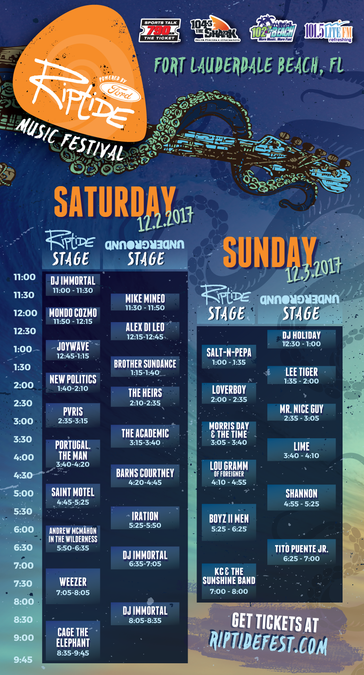 Riptide Music Festival will be the site of a two-day music beach party! Saturday's lineup is more alt-rock based and Sunday's lineup is more pop themed. Cage the Elephant, Weezer, Andrew McMahon in the Wilderness, Portugal, the Man, Iration, Pvris, Saint Motel, New Politics, Mondo Cozmo, Barns Courtney, Saint Motel, the Academic, MiQ, Alex Di Leo, Brother Sundance, Los 5, the Heirs, Mike Mineo. KC and The Sunshine Band, BoyzIIMen, Foreigner’s Lou Gramm, Salt-n-Pepa, Morris Day and The Time with a tribute to Prince, Tito Puente Jr., Loverboy, Shannon, Lime, Mr. Nice Guy. The Nutcracker is a classic Christmas fantasy told through ballet. Featuring 60 local Ballet Palm Beach Academy student dancers and 20 local professional dancers. Friday, December 1 at 7:30 p.m.
Saturday, December 2 at 2 p.m. and 7:30 p.m.
Sunday, December 3rd at 2 p.m. If you have an appetite for dark comedy, desperate measures, and a doo-wop score, you'll want to plant yourself in the Rinker Playhouse for a musical that sprouted from a low-budget horror film. With the fertilizing touch of composer Alan Menken and playwright Howard Ashman, the peculiar tale of a shy floral-shop worker and his carnivorous cohort has become a quirky classic. This fun and free community event let visitors hunt for hundreds of candy canes hidden across Downtown at the Gardens. This event includes holiday crafts, bounce houses, festive activities and more. Special prize for the golden candy cane. Space is limited. Families are asked to check in at the Macaroni Kid tent 10 minutes before the hunt. The Big Kid Hunt will begin at 11:15 a.m. and the Toddler Hunt will begin at 12:15 p.m.
Saturday, December 2 from 11 a.m. to 1 p.m. The public is invited to bring their precious pets to “paws” for a picture with Santa. Each person will receive two free 4x6 inch prints and one digital download. A $10 donation is suggested to benefit Peggy Adams Animal Rescue League. Sunday, December 10 from 6 p.m. - 8 p.m.